The Super Plush Microfiber Combo includes four of our softest, thickest microfiber detailing towels. The Super Plush Deluxe and the Super Plush Junior Microfiber Towels take softness to the extreme with extra thick 600 g/mï¿½ microfiber. Once you buff your vehicle with one of these microfiber towels, youï¿½ll never use anything else! Both towelsï¿½ birthplace is Korea but you could say their upbringing was in China. The result is the best of both worlds. The luxurious microfiber was woven by a Korean company who owns what we call a splitting machine. This machine is responsible for the absorbent split-weave that is found in towels. Because of the expense of this machine, itï¿½s uncommon in Korea and nowhere to be found in China. However, the cost of labor in China is much lower. By having the fabric woven in Korea and the towels cut and sewn in China, weï¿½ve acquired these towels at a substantial savings while maintaining quality. When you use either Deluxe 600 Microfiber Towel, youï¿½ll feel the quality in the thick, plush weave. Both towels have features you wonï¿½t find in other towels. 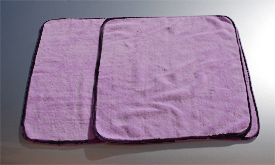 The Super Plush Towels both have microfiber borders, which provide softness all the way to the edges. Both towels have removable tags. Thereï¿½s nothing on the towels that can scratch or mar the paint. Note: Remove the sticker before washing the towel. 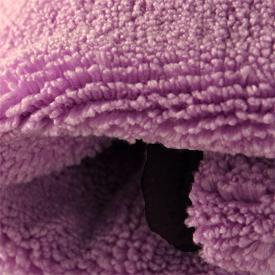 Plus, both towels are made of the super thick 600 g/mï¿½ microfiber! Get the Super Plush Microfiber Combo and feel good about what touches your vehicleï¿½s paint. Our thickest microfiber pampers and protects the paint like nothing else. A total retail value of $33.96. Save $8.97! A plush towel that does't lint. I have 6 of the Shamrocks and they lint like crazy which is magnified on my black truck. I used the Crobra Delux to clean off the lint mess left by the Shamrocks. The plushness of these towels make it perfect for final buffing and quick detailing. Excellent quality as with all of the Cobra line. These are great microfiber towels, you can use them for any purpose. They're so soft and thick, and are great for wax/polish removal, detail sprays, and anything else you can think of for your detailing needs.